Before luxury spas, Londoners didn't know how to bathe properly. We lacked the healing waters of Bath or Buxton. We couldn't Hamman like Budapest or Prague. We didn't do sauna like the Swedes or Finns. But, as this list of the best spas in London shows, we can now have a bath with the best of them, thanks to great London hotels with inner sanctuaries, and top brands like Aveda and Cowshed with their own beauty salons. With such great choices for winding down, it's amazing we get any work done. Based inside the sleek and chic Ham Yard Hotel the Soholistic Spa offers everything you could want for getting away from it all. Sit back amongst the eccentric English decor and enjoy a plethora of beautifying treatments from manis and pedis to full body waxing and eyebrow tinting. Their highly advanced facials, which use the very best of British based products, work wonders for super boosting collagen and instilling an all-over glow. Their Hypnoxic studio is a fascinating addition. Inside, you'll step into an oxygen atmosphere similar to that found 2,000 metres above sea level and have the opportunity to exercise at high altitude, which works to accelerate improvement so you'll get instant tangible results. Who needs the alps? Top treatment: The Liz Earle Superskin Botanical Lift Facial, £120 for 50 mins. Coined ‘a complete workout for the face’, this 50 minute facial will leave you looking and feeling 10 years younger. For a true break away from the city, trade your stilettos for slippers and get back to mother nature at the Flagship Aveda Salon. Aveda aims to bring its guests a wholly sensory experience with each treatment taking on a bespoke holistic approach, tapping into the sights, smells and sounds that meet each individual persons needs. From the dark oaky interiors (reclaimed from Canadian riverbeds, of course) to the ethically sourced products, an afternoon here leaves you feeling, not just at one with yourself, but the rest of the world too. Top treatment: Stress-Fix Body Massage, £56 for 30 mins. A combination of reflexology, deep tissue and aromatherapy techniques - a combination bound to get to the source of your problems. An oasis of tranquillity nestled in the heart of Chelsea, Ushvani has been voted the best day spa in London on numerous occasions - and it’s not hard to see why. On entry the intense and heady aromas of ginger, nutmeg and pandan leaves greet you, while the tropical fish tanks, Asian art and Malaysian level climate work to transport you to an exotic paradise. But if ambience is their first priority, quality is most definitely their second. Each therapist is carefully vetted before undergoing three months of intensive training in the art of shiatsu, Thai, Balinese and Malaysian therapies. They’ve also created their own line of products using just hibiscus flowers, mangosteen and kemiri nuts - a recipe that took nine years to perfect. Top treatment: Coconut Milk Body Wrap, £60 for 30 mins. Layers of fragrant coconut milk work to soften, smooth and add silkiness to skin - as well as leave your body smelling good enough to eat. For a less spiritual and more straightforward approach, head down to The House of Elemis Day Spa, where simplicity meets modernity. Hidden beneath the facade of a luxurious Mayfair townhouse lies the potential for a more primed and perfected body. Based around the importance of understanding the science of good skin Elemis fuses cutting-edge technology with revolutionary treatments that are both of the highest quality and performance. Indeed, taking the body’s complex physiology into consideration, everything from a pregnancy massage to a Pro-Radiance Nail coat here has been designed with the latest forms of innovation and creativity. It’s the ideal destination for those who like to ensure a certain degree of success every time. Top treatment: Sole Delight Grooming For Feet - therapeutic oils condition and nourish hard, overworked feet in a treatment that really works to take the weight off. If you need a spa fix, fast, Cowshed's speedy menu mean you can get that facial, mani/pedi and an eyebrow treatment all within an hour (or lunch break...). Similarly, be it a birthday or simply a catch-up with friends, this spa heads up ‘Pretty Parties’ that can accommodate any number of guests for an afternoon or evening of cocktails, canapés and a selection of relaxing and indulgent treatments. With a relaxed, cool and comforting atmosphere an afternoon here feels like time spent on the sofa of your best friend's house. 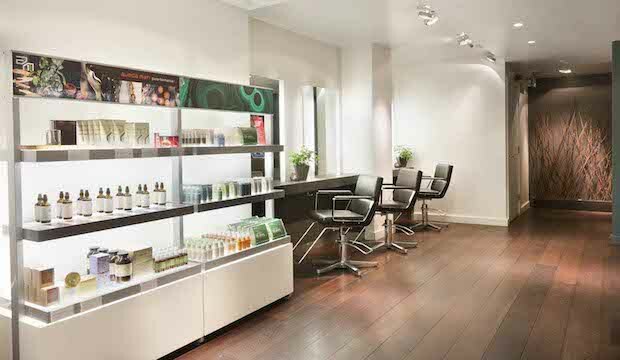 Top treatment: Cowgroom Maintenance, £85 for 60 mins. Two therapists work in synchronisation to provide head-to-toe relaxation involving pressure point massages, pedicures and indulgent facials. Atop Harrods is a Moroccan hamman. This staggeringly beautiful, regal spa is designed as an all-female environment, though there are a few mixed and male-only sessions. Playing a significant part in Moroccan culture for centuries, a traditional hammam involves the steaming, scrubbing and massaging of skin until it’s beautifully refreshed. At marocMaroc, this is done in three steps. First you will spend time in a warm room to acclimatise your body to the heat, before then moving on to the main hot hammam where your personal kessala (assistant) will carry out the luxury cleansing and bathing ritual with traditional black soap. To finish, you’ll be taken to a decadent lounging area. With massages, refreshments and constant on-hand attention, you'll feel as pampered as if you'd taken a two-week holiday abroad. Top treatment: Ceremonial Massage, £80 for 50 mins. Their signature treatment uses traditional argan oils and monoi butter to hydrate the body and leave you with softer, silkier skin. Regarded by many as the crowning glory of the Bulgari hotel, this fashion-forward spa offers up a veritable oasis of pure urban luxury. Decorated head to toe in rich, smooth oak and bottle green onyx marble, this vast spa space stretches out across two subterranean storeys and is not totally dissimilar to Batman’s cave. Promoting treatments that work to improve the outside in order to harmonise the inside, this spa has also harnessed slightly more left-field treatments, such as The Spinal Code Duration, which involves a deep massage of the back, neck, and head based on Einstein’s theory of energy equating to matter, and thus thoughts and emotions being able to affecting the physical being. As a destination it’s particularly loved by fashionistas and brides-to-be. Not be your average afternoon of pampering, it's the five star, gold studded treat you always thought you deserved. Top treatment: Back, Face and Scalp Treatment, £200 for 90mins - their hero treatment and ultimate crowd-pleaser, using Espa products to deliver triple results by targeting three main areas of stress and tension. Watch this space: The Lanesborough Hotel opens its new spa in Spring 2017. It promises lots of lovely touches like a ladies' dressing room, complete with mirrored dressing tables, a gentleman's club and thoroughly English decor throughout, from wooden panelling to silk and leather upholstery.